Maelstrom consists of three planes. The Overworld, home of holy immortal spirits, the Mortal Realms, home of humans, beast-humans, and some immortals, and the Underworld, home of demon spirits. Immortal spirits were once able to freely traverse between planes, however a powerful seal created at the end of the Catharsis has shut away the Mortal Realms. Now, immortal spirits remain stranded in the Mortal Realms and sentient spirits are unable to cross planes again. Mortals cannot survive in other planes. Due to the limited scope of their world, "Maelstrom" and "Mortal Realms" are often used interchangeably in colloquial speech. Magic is commonly practiced by the inhabitants of the Mortal Realms. Sorcery and Summoning refer to a user's control, manipulation, or influence over demon, holy, or a rare soul spirit. Elemental Magic draws its power from the essence of the Mortal Realms: water, fire, air, and earth. Only beast-humans are known to be capable of wielding Elemental Magic. At the beginning of the story, the kingdoms of Maelstrom have prohibited all usage of Common (Demon) Magic. Rooted in the use of demon spirits as its power source, Common Magic is believed to be the cause of Carciphona and a mysterious assassin who is immune to magic. Magic is spirit manipulation. Magic can be either an innate skill or an acquired one depending on the race of the user. Some magic is a birthright for a race while others are available to all those who are willing to learn. There are four different kinds of magic, distinguished by their source of power: Demon, Holy, Elemental, and Soul. There are a few standard ways to use magic; freeform, spells, and summons. Freeform magic allows the user to do anything imaginable with their power, but it requires much more skill, control, and strength than other forms of magic. Magical spells are a set of established procedures and rules usable by even the most novice of casters, however they are less flexible than freeform magic and sometimes require preparation. Spells are nearly indistinguishable from freeform magic when cast by a master practitioner. Unlike freeform magic and spells, summoning influences the will of a sentient spirit rather than drawing upon threads of spiritual essence to weave into magic being cast. The most common way of summoning is by music, and almost all summoners are musicians. Individuals who are innately connected to spiritual presence have always claimed to hear songs as a manifestation of sentient spirits. Summoning is said to be easier than sorcery, freeform magic, or spells, and is a common alternative for those who wish to learn magic but are unable to mastery sorcery. Summoning is typically restricted to immortal spirits. Summoning is called necromancy when used on mortal spirits, such as humans, beast-humans, and animals, because it results in the death of the summoned entity. Regardless of type, those who use magic are collectively simply called magic users. Common occupations before the Prohibition include casters, summoners, spellsmiths, spellscribes hearers, augur, etc. Demon magic, also referred to as Common Magic, is the form of magic most accessible to mortals. Demon magic has no restrictions and requires no qualifications; only the will to try is needed for any mortal who wishes to use it. Until the Prohibition, Demon magic had been an engine of growth and prosperity for the Mortal Realms. Used to increase the effectiveness and efficiency of civilization, Demon magic had pervaded every aspect of human life; from long distance transportation, communication, and heavy construction, to the tedium of daily life, all developed to utilize aid of Demon magic. Though blamed for the spread of Carciphonas, there have only been isolated cases of demon spirits having an averse effect on human souls. There is no conclusive evidence linking demon magic use to an increased risk of infection. Holy magic is the counterpart to Demon magic. Similarly accessible to Demon magic in theory, Holy magic is rarely used in practice. Worship and respect stemming from the Catharsis has created a belief that holy spirits are sacred and should only be tapped by the worthy. Today, only members of the clergy are permitted to learn Holy magic of any kind. Aside from its appearance, Holy magic is indistinguishable from Demon magic. Soul magic is the rarest form of magic practiced. It draws power from a mortal's soul spirit, be it the caster's own or another's. Unlike an immortal spirit, a mortal spirit is limited, and depleting a soul's energy causes great harm or even death to its mortal. However, Soul magic can be extremely powerful; in bursts, it is able to trump over both demon and holy magic. As a result, it is enticing for humans to use Soul magic despite its steep price. Lawful use of this type of magic typically involves self-defence or situations where other types of magic are inaccessible, such as within a spiritual barrier. Elemental magic is used exclusively by beast-humans. As all beast-humans have the innate ability to sense and interact with the essence of the Mortal Realms, the elements around them, they are able to wield elemental magic. Beast-humans have an ancestry rooted in the fabric of the Mortal Realms, they believe themselves to be born of the Mortal Realms itself, and their innate ability attests to this claim. Therefore, most tribes teach their young the arts of elemental magic as an important part of their upbringing, and almost all beast-humans are fluent users. The only exception are beast-humans who are inexplicably unable to cast any form of magic. The lower order form of Elemental magic draws from substances, such as water, vegetation, or sparks, near the caster. Higher order Elemental magic can be cast even when there is no nearby source; the caster calls upon the realm itself to bestow the elements upon themselves. Magic can be enhanced or facilitated by a channeling medium. A medium can be any entity, dead or alive, besides the user. Most commonly used mediums come in the shape of weapons, accessories, books, or other devices made especially for such use. The channeling medium allows a user to focus outside of the abstract space of their minds, thus removing doubt or distractions that are commonly experienced by beginners. Advanced users also benefit from using channeling mediums. A medium can be used to gain access to greater magical strength than the caster is able to naturally weave. For example, a staff can be spellbound with amplifiers prior to casting in order to increase the caster's magical output. Protection brooches and gems can also be infused with powerful magic and then activated by a simple spell. These pre-charged artifacts greatly reduces the amount of magic required from the user. A human-like race that possesses animal features. Beast-humans have the same lifespan as humans and most live between 80 to 150 years. Beast-Humans take after several species of animals, the most common being felines (Enfelids) and canines (Encanids). Besides being imbued with Elemental Magic from birth, Beast-Humans can also shape shift into their respective animal forms. Until recent years, they normally lived in scattered tribes far away from human civilization. There is hostility between different tribes within the Beast-Human race. Elves are an immortal human-like race with pointed ears. Along with other immortal races, Elves are said to have descended onto the Mortal Realms during the Catharsis in a bid to save the realm from destruction. They are the most similar to humans out of all the immortal races that descended during the Catharsis, and are subsequently the hardest to distinguish. Humans are only certain about their existence because of stories told by fairies. Fairies are an immortal race with elven ears and dragon-fly wings. Fairies like to embellish themselves in ornate, metallic adornments. They are the only race of immortals from the Catharsis that humans have spoken to in the centuries afterwards. Though the number of meetings are exceptionally rare, the information shared by fairies have tremendously helped shape human understanding of the Overworld. Humans are the largest civilization in the Mortal Realms. Although most humans live only 80 to 150 years and are born without natural magical affinity, humans have gained access to Holy, Demon, and Soul magic through ages of study. Before the Prohibition, Demon magic had been an integral part of everyday human life. Holy spirits are spiritual entities said to inhabit the Overworld. They are the purest form of holy magic. Only extremely powerful holy spirits possess a will of their own. Lesser spirits are unable to maintain a consistent form and cannot be perceived by mortal senses. Most spirits are naught but sand in the wind and can be freely called into the Mortal Realms for use with sorcery, but those who are powerful and sentient are unable to pass through the seal between worlds. Demon spirits are spiritual entities said to inhabit the Underworld. They share the same properties as Holy spirits and differ only in appearance and origin. Mermaids are an immortal race with elven ears and fish-like fins. They have been sighted both in the Veil, the oceans surrounding the Mortal Realms, and in the clouds of the skies. Said to have originally come from the Overworld, mermaids were one of the many races of immortals who descended to the Mortal Realms during the Catharsis. An immortal race with elven ears and bird wings that came to the aid of the Mortal Realms during the Catharsis. Abundant in number during the Catharsis, they are most vividly described in those tales. Along with elves, Angels have not been seen since the Catharsis. However, due to the vast amount of records and folklore from that time period, they are the most convincingly believed to exist among all immortals that vanished after the Catharsis. The Catharsis Records is a set of texts that documented a catastrophic event which nearly brought the Mortal Realms to destruction about 700 years ago. Each text is not related to another in their origins and were only gathered into a collection by scholars studying the event many centuries later. It was expected that there would be much writing done on this event, however only six complete accounts were found in the Mortal Realms after decades of painstaking search. Some of these were informal and personal, some were detailed and carefully compiled, but every tome referred to the chaotic times as "the Catharsis". Thus, these volumes were later collectively referred to as the Catharsis Records. There are two main groups of humans that are easily distinguishable by look. The minor population of Northerners are characterized by their clothing style that is distinctly different in roots than the rest of the world, as well as pale skin and dark hair in those whose heritage remains pure even after centuries of assimilation. Their cultural emphasis is on observation and acceptance. The rest of the population uniformly makes up the vast majority of the inhabitant of the Mortal Realms, with roots difficult to accurately trace because of the cultural melting pot the land has become after the Catharsis. Beast-Humans are the only other distinct, structured mortal race inhabiting the Mortal Realms aside from humans. Dwelling in isolated, sometimes nomadic tribes scattered around the realm, Beast-Humans historically stayed far away from human influence and contact. However the Prohibition created a sudden void of magical talent for what some humans consider even the most basic living needs, and demand for alternative magical talent has drawn some beast-humans to human settlements for a chance at an easy, prosperous life. When the Catharsis ended about 700 years ago, survivors of the Mortal Realms have united to rebuild their world. With the wounds of destruction still barely healing, when most of the world was restored, the kingdoms honoured each other's lands without dispute. These kingdoms have remained more or less the same over many centuries in peace. Some smaller nations were absorbed by their neighbouring countries by means of war later on, but none large scale enough to leave a mark in history. 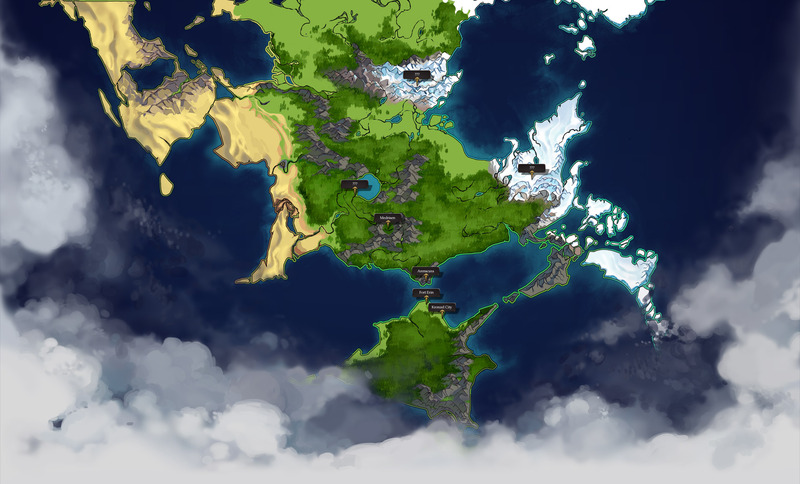 Before the start of the story, Kingdoms of the main continent had recently recovered from a few decades of chaotic warfare that ended abruptly. Today, the most prosperous and advanced Kingdom of the Mortal Realms is Raschecura. The story starts in the kingdom of Kronzel. The Veil refers to the threshold of Mortal Realms, where physical existence begins to disintegrate. This manifests as an impenetrable storm in the seas surrounding the main continents, an unreachable depth below ground and sea bed, and blinding curtains of light that drape the heavens. The phrase is often used to refer to all of the above phenomena despite them being separate and different events. Since the beginning of recorded history, humans have had great interest in venturing beyond this limit, but those who were lucky enough to not have embarked on a one-way trip never made it far. Humans have since acknowledged that the Veil is inviolable. Beast-Humans read the land for guidance, and have no desire to trespass the boundaries the land presented to them. Neither rooted tribes nor nomadic tribes had ever set eyes beyond where land ends and endless blue begins. The Prohibition was established about four years before the start of the story. It is a collective agreement between all human nations of the Mortal Realms to outlaw the use of Common Magic by anyone for any reason. Individuals or groups violating its terms are to be prosecuted by all kingdoms in agreement unanimously, whether by exile or execution. The Prohibition was established because of a possible link between the practice of demon magic and the appearance of a terrifying human assassin who is invulnerable to magic. The lives of many whose professions were deeply connected to sorcery were devastated. There was protest against the mandate due to its impact on every human's daily lives, but as elemental and holy magic slowly to replaced demon magic, dissent faded and the impact of the ban was soon forgotten by most commoners. Because of the Prohibition, positions previously occupied by sorcerers were replaced by Beast-Human mercenaries, whose magical abilities did not stem from demon spirits nor the strictly regulated holy spirits. This trend brought many Beast-Humans who previously preferred to keep their distance from humans a change of heart, and an influx of Beast-Humans into human settlements was experienced by large and small nations alike. The existence of spiritual entities in Maelstrom is common knowledge to the inhabitants of the Mortal Realms and an integral part of everyday life. Most people who are not magically inclined cannot sense, see, or hear spirits, but with the help of a skilled medium, a sorcerer or an artifact, anyone can be shown these spirits. Through records of documented communication with immortal spirits, or, in rare cases, actual immortals, humans were able to learn more about the spirits that inhabit other planes. However, knowledge gained this way is incomplete and sometimes inaccurate. Although humans revere and worship these immortals, part of their reverence hinges on faith and belief. Most humans worship the immortal spirits from the Overworld--holy spirits, following the Church of Catharsis. The church welcomes humans of all backgrounds: the rich, the poor, magic users and non-users alike. Many of the followers are themselves sorcerers, Demon magic users, as demon magic has never been widely branded as evil until the wars preceding the Prohibition. The worship represents gratefulness towards the phoenix Auresque: the Goddess of the Overworld who sacrificed herself for the Mortal Realms to put an end to the Catharsis. There is a small group of humans--almost entirely composed of sorcerers--who dedicate themselves to the Demon Lords. The order is more often considered a research group than a religious order, since they spend most of their time seeking knowledge about these virtually unknown Demon Lords. Beast-Humans worship exclusively the Goddess Hiraeth, a spirit that they believe created the Mortal Realms, and subsequently the Beast-Humans, from her own being. Many manifestations of Hiraeth exist as large, sentient tomes called The Book of Elements by Beast-Humans, with each tribe possessing one of these books for worship, guidance, and communication.